According to yesterday’s Alexa numbers, Americans make up 48.1% of our visitors, followed by the UK with 8.1%, Canadians 7.2%, Australians 5.6% and Germans 5.1%. 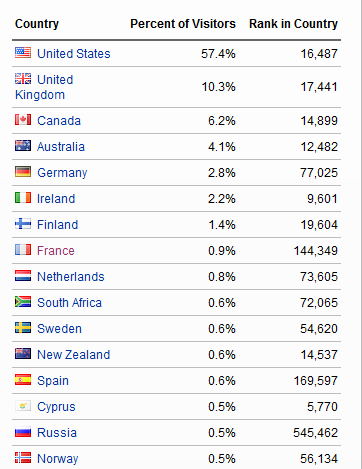 The rest of the countries contribute less than 2% of visitors each. What’s most astonishing about our Alexa numbers is that in small countries with languages other than English, our ranking is 10-20 times higher than in English speaking and major European countries with high English literacy, when, common sense tells you, it should be the other way round. So why does the Rebel Site have a ranking of 353 in a country like the Seychelles, 1,112 in Fiji, or 3,209 in Gibraltar, but then only 85,575 in Australia or 170,321 in the United States? Makes no sense, does it?! At first I suspected that this might have something to do with the very small number of Internet users in those countries. Statistical data are always more accurate if taken from a bigger sample. But then, shouldn’t those numbers go up and down a lot?! They don’t. The highest ranking countries, Seychelles, Fiji and Gibraltar always rank the highest and fluctuate no more than others. Then I had a look at the countries where we are ranked somewhere in between the major English speaking countries and those highly ranking mini-states. There are many Latin American and Eastern European countries, with much higher ranking than the countries most of our traffic is coming from. Something else is remarkable, the case of Singapore and Hong Kong. They are both predominantly Chinese, a population with very little interest in the topics covered on our site, which is reflected in the very low visitor numbers coming from there. And yet, both rank higher than the United States and the United Kingdom, the two countries with our highest visitor numbers. Makes no sense at all. Interestingly, every so often our Alexa rankings spike dramatically for one day. On each of those spikes our rankings go up by around 80-90% in those countries where the bulk of our traffic is coming from. What added to my suspicion was the fact that Alexa’s daily and monthly unique visitor numbers are only a fraction of those reported by our server stats tools, even though they claimed only to have excluded about 30% of web traffic because it comes from spiders and robots. According to Alexa, the Rebel Site only receives an average of 1,600 daily unique visitors. My own server stats are telling me it’s between 7,000 and 20,000. So one way, how they keep the ranking of politically incorrect sites down, is by ignoring a larger percentage of their traffic than they admit. All of the above could be just me being paranoid. I’ve been in the truth business for so many years, it’s easy enough to see conspiracies everywhere. It could all be just a coincidence or a glitch, but how many coincidences and glitches that are good for the establishment do you need until you admit that there must be more to it? Reputation metrics play an important role in Alexa’s global ranking formular. They are just as important as the percentages of Internet user visits and Internet pageviews your site receives. Today I discovered something else when checking our Alexa figures. Have a look for yourself and see if you notice anything. What startled me was yet another discrepancy between the Alexa stats and my stats from alternative sources, like Google and Facebook. 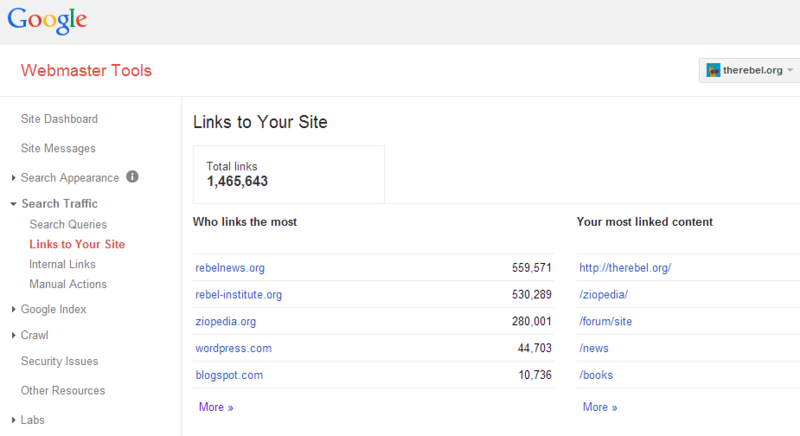 According to Google’s webmaster tools, there are 1,465,643 links to therebel.org. That’s links, not sites. If you deduct the internal links from rebelnews.org, rebel-institute.org and ziopedia.org, which are all former domain names of the Rebel Site which are currently parked on therebel.org, you still end up with 95,791 links. Google’s webmaster tools doesn’t tell me the number of sites that link to mine, but it sure is more than Alexa’s 1570 claimed sites. I might add, I find it highly suspicious that Google does not provide that number in its webmaster tools. They obviously don’t want people to be able to cross-check their figures against Alexa’s concocted stats. With Facebook’s stats it’s even more obvious. 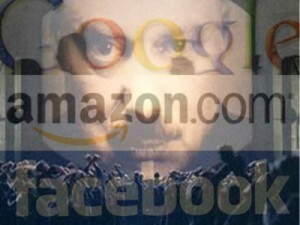 Alexa claims my site had only 93 Facebook likes and 218 shares, which is ridiculous. Any popular article from John Kaminski and myself has dozens of Facebook likes and shares each. Some have hundreds. 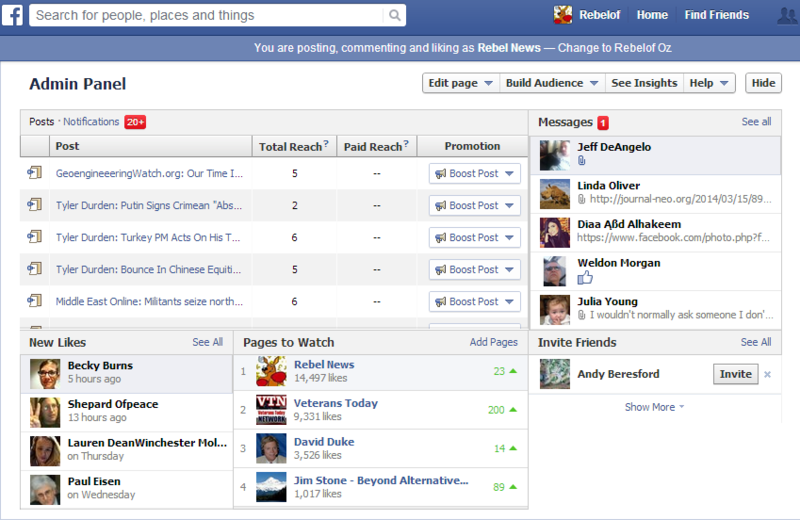 And the Rebel Site page itself has about 14,500 likes. While these Facebook stats are only referring to the Facebook pages, not the site itself, it gives you an indication of the ratio how the sites compare in popularity amongst Facebook users. So how come that Alexa claims that David Duke and Jim Stone have so many more Facebook likes? What’s going on here? I’m sure if I digged deeper, I’d find more evidence that Amazon owned Alexa is falsifying its stats. I’m convinced Alexa’s global ranking of anti-establishment sites like mine are kept artificially low because of the effect this has on the prominence of their content in search engines like Google and Bing. The higher their Alexa ranking, the closer to the front their web pages are listed. The reason for displaying the real numbers every so often, I assume, is to provide government services and private thought police organisations such as the ADL and SPLC with the real numbers of ‘hate sites’ like ours. Or maybe, it’s just a technical glitch.